Kemuff mailed me some fur from her two dogs Bear and Rosceaux. I took it, cleaned it, conditioned it, dried and fluffed it out, and then spun it. From there it was measured, crimped, and cut so I could start doing the silver work. The silver I use in all my jewelry is Half Hard which is stronger than the regular stuff. This is mainly all 20ga sterling silver but the jump rings and clasps are 18ga sterling silver for extra durability. 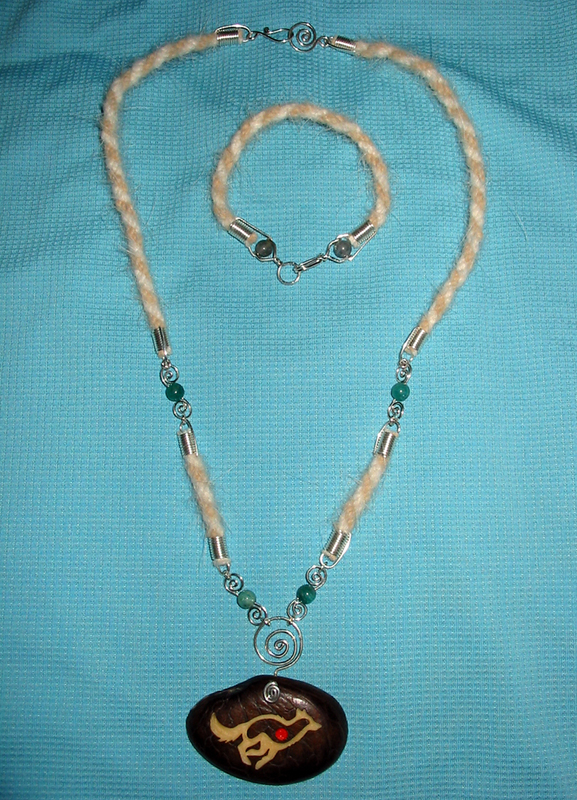 And finally, the pendant was made by Foxfeather Zenkova, a very talented artist on DA and on her own site www.foxloft.com. This is her Carved Running Wolf Pendant from her Tagua jewelry series which is a vegetable ivory that looks and feels like the real thing. It truly is gorgeous and I love how she keeps it in its natural look like this. I hope you will love it, Kemuff!